Francis Bacon was born on the 28th of October in 1909. He was an Irish-born British figurative painter known for his bold, grotesque, emotionally charged and raw imagery. His works of art are filled with abstracted figures are typically isolated in glass or steel geometrical cages, set against flat, nondescript backgrounds. Bacon started with painting in his early 20s but, he worked... Read moreFrancis Bacon was born on the 28th of October in 1909. He was an Irish-born British figurative painter known for his bold, grotesque, emotionally charged and raw imagery. His works of art are filled with abstracted figures are typically isolated in glass or steel geometrical cages, set against flat, nondescript backgrounds. Bacon started with painting in his early 20s but, he worked sporadically and uncertainly on his artwork until his mid-30s. He drifted as a highly complex bon vivant, homosexual, gambler and interior decorator and designer of furniture, rugs and bathroom tiles. He later admitted that his artistic career was delayed because he spent too long looking for subject matter that could sustain his interest. His true breakthrough came with the 1944 triptych Three Studies for Figures at the Base of a Crucifixion, which in the immediate aftermath of the Second World War, sealed his reputation as a uniquely bleak chronicler of the human condition. Remarking on the cultural significance of Three Studies, the art critic John Russell observed that "there was painting in England before the Three Studies, and painting after them, and no one...can confuse the two." 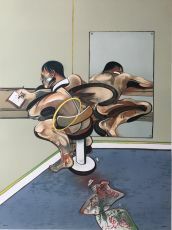 Bacon said that he saw images "in series", and his artistic output typically focused on a single subject or format for sustained periods, often in triptych or diptych formats. His output can be crudely described as sequences or variations on a single motif; beginning with the 1930s Picasso-informed Furies, moving on to the 1940s male heads isolated in rooms or geometric structures, the 1950s screaming popes, and the mid-to-late 1950s animals and lone figures. These were followed by his early 1960s variations on crucifixion scenes. From the mid-1960s he mainly produced portraits of friends and drinking companions, either as single or triptych panels. Following the 1971 suicide of his lover George Dyer, his art became more sombre, inward-looking and preoccupied with the passage of time and death. 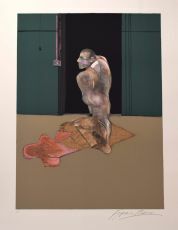 The climax of this later period is marked by masterpieces, including his 1982's "Study for Self-Portrait" and Study for a Self-Portrait—Triptych, 1985–86. Despite his bleak existentialist outlook, solidified in the public mind through his articulate and vivid series of interviews with David Sylvester, Bacon in person was highly engaging and charismatic, articulate, well-read and unapologetically gay. He was a prolific artist, but nonetheless spent many of the evenings of his middle age eating, drinking and gambling in London's Soho with like-minded friends such as Lucian Freud (though the two fell out in the 1950s, for reasons neither ever explained), John Deakin, Muriel Belcher, Henrietta Moraes, Daniel Farson and Jeffrey Bernard. After Dyer's suicide he largely distanced himself from this circle, and while his social life was still active and his passion for gambling and drinking continued, he settled into a platonic and somewhat fatherly relationship with his eventual heir, John Edwards. Bacon was equally reviled and acclaimed during his lifetime. Art critic Robert Hughes described him as "the most implacable, lyric artist in late 20th-century England, perhaps in all the world" and along with Willem de Kooning as "the most important painter of the disquieting human figure in the 50's of the 20th century. 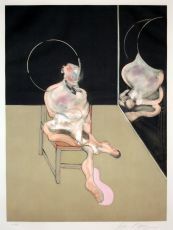 "Francis Bacon was the subject of two Tate retrospectives and a major showing in 1971 at the Grand Palais. 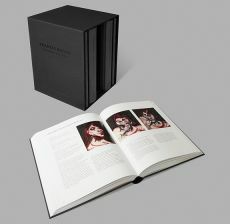 Since his death his reputation and market value have grown steadily, and his work is amongst the most acclaimed, expensive and sought-after. In the late 1990s a number of major works, previously assumed destroyed,including early 1950s popes and 1960s portraits, reemerged to set record prices at auction. On 12 November 2013 his Three Studies of Lucian Freud set the world record as the most expensive piece of art sold at auction, selling for $142,405,000, until exceeded by the sale of Picasso's Les Femmes d'Alger in May 2015. 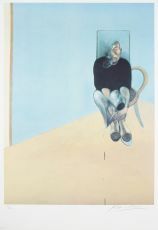 Francis Bacon died on the 28th of April in 1992, during a holiday in Madrid. He died of a cardiac arrest, but he had suffered from chronic asthma all of his life. His most famous works include themes like The Scream and The Crucifixion.